SDMO Industries is one of the world’s leading generating set producers with annual production of almost 100,000 generating sets fitted with diesel or gas engines for portable power, rental power or industrial power production. A wide range of standard products from 1kVA to 3,000kVA through an efficient engineering department meets non-standard requirements. From its strong base in France, SDMO Industries has developed its export business. Present in over 150 countries through a network of agents, distributors, seven subsidiaries in England, Spain, Belgium, Nigeria, Brazil, Argentina and the US, and three liaison offices in South Africa, Algeria and Russia, SDMO Industries devotes its energy to supporting you in the successful completion of each of your projects worldwide. Four factories enable this production to be achieved, three in France and one in Brazil. Combined with technological know-how, this industrial power enables SDMO Industries to maintain its international rank in terms of generating set design, manufacture, engineering and maintenance. Generating sets from 0.9kVA to 15kVA – whether for professional use or for leisure, the specificities of the generating sets in the portable power range meet all expectations – petrol or diesel engines, low sound level, isolated or intensive use. WELDARC welding sets up to 200A – essential for welding on sites with no electricity, they can also be used as a standby power source. AQUALINE water-pumps – SDMO motor-driven pumps can pump clear to very turbid water. These generating sets are from 7.5kVA to 3,000kVA. They are multi-voltage, whether for continuous or standby use, you choose the set, which suits you and define its functionalities using a wide range of options. Strong partnership agreements with the main partners and in particular the engine manufacturers make it possible to offer constantly optimised products at an impressive cost level. Generating sets in the rental power range are designed specially to meet the needs and to incorporate the essential qualities for users in the public buildings and works sector. These generating sets are subject to intensive use often in hard conditions. Reliability, compactness, robustness, safety and ease of use are the major advantages of these generating sets. SDMO Industries’ engineering department has 80 engineers and technicians, and supports you in the elaboration of your project both technically and commercially. The department’s role is to study precisely the special constraints and demands of your requirement, and to provide you with the concrete solutions incorporating the most innovative technologies. A generating plant in the heart of the desert, standby sets in hospitals, military or on-board sets, cogeneration plant, SDMO generating sets fit a multitude of applications, from the simplest to the most complex, while at the same time complying with the demands associated with the latter (sound level, dimensions, weight, constraints associated with the environment, etc). True to its desire to meet its partners’ needs ever more efficiently, SDMO Industries offers a complete range of quality additional services. Technical assistance – whilst providing precise answers to all the technical questions submitted to it, our after-sales department offers technical assistance worldwide. Every day, SDMO technicians and engineers see to it that you are satisfied so that your installations give of their best. Spare parts – these guarantee the durability of SDMO installations worldwide. They are responsible for the management of stocks and supplies. They ensure delivery on time to the four corners of the world. Training – 2,200 days of courses are given each year so as to enable our distributors and customers to continuously update their knowledge of our products. These courses are given in several languages in Brest or on-site. To provide you with every guarantee of reliability, SDMO has introduced a quality process. Its careful fulfilment of this commitment has enabled it to obtain the ISO 9001 registration. The reputation for service quality acquired by SDMO worldwide is the result of this ongoing striving for improvement. 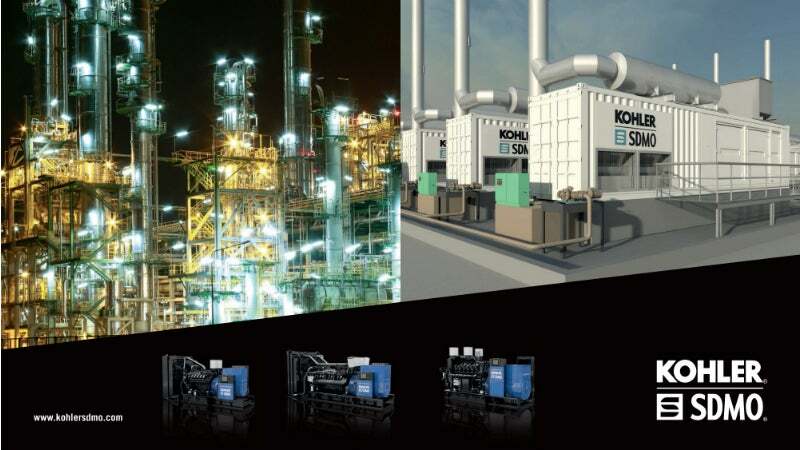 KD SERIES is the new line of generating sets equipped for the first time with state-of-the-art KOHLER diesel engines. These generating sets benefit from unprecedented power density, making the KD SERIES an ideal range to meet the most exacting requirements. KOHLER G-Drive diesel engines are manufactured with the highest-quality materials and systems. KOHLER G-Drive diesel engines offer outstanding specific power in a clean, modular design.